Traditional strategic planning is dead! 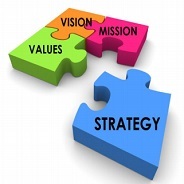 According to several surveys of top executives only 19% of strategic plans achieve their objectives and only 25% of executives and staff are motivated by the strategic plans created. Finally, an insightful and innovative on-site training that consolidates and simplifies the tedious traditional strategic planning process for any organization. Conducting Strategy Health Checks, Tactical Adjustments, and More!